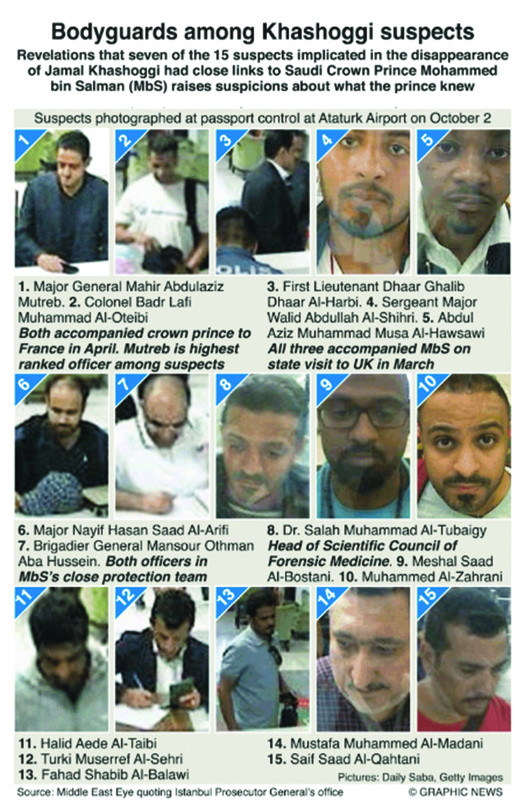 Revelations that seven of the 15 suspects implicated in the disappearance of Jamal Khashoggi had close links to Saudi Crown Prince Mohammed bin Salman raises suspicions about what the prince knew. Details of an audio tape acquired by Turkish investigators probing into what happened to Saudi journalist Jamal Khashoggi, at the Saudi consulate in Istanbul, Turkey, have been made available to London-based Middle East Eye (MEE). According to a source from the Istanbul Prosecutor General’s office, Khashoggi was dragged from the office of Saudi Arabia’s Consul General, Mohammad Al-Otaibi, onto the table of his study next door. Screams were then heard by a witness downstairs, the Turkish source said. The consul general can be heard protesting but is told: “If you want to live, be quiet!” The screaming stopped when Khashoggi was injected with an as yet unknown substance.